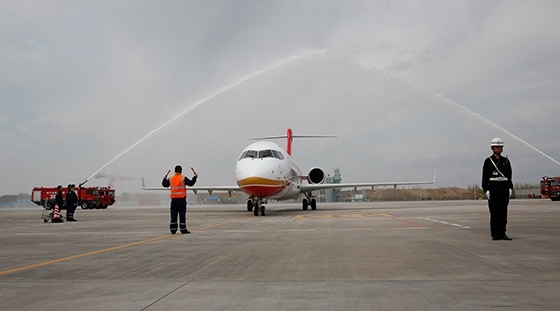 Opening five routes at a time, and being committed to constructing a trunk and regional aviation network with Harbin as the hub__Commercial Aircraft Corporation of China, Ltd.
ARJ21 aircraft flying Flight EU2239 of Chengdu Airlines for the first time went through the water gate on May 2nd, 2018. ARJ21 aircraft flying Flight EU2239 of Chengdu Airlines for the first time took off from Chengdu in the morning of May 2nd, 2018 and landed at Harbin Taiping International Airport at 11:28, with a stop-over at Jinan; the aircraft took off again in the afternoon and set off on a round trip between Harbin and Heihe. This indicates that the passenger-carrying operation of ARJ21 aircraft in Heilongjiang province, the northernmost province in China, is officially carried out, the new mode of "taking Harbin as the hub and carrying out base and regional aviation operation" is officially started, and the route operation as well as the marketing and industrial development of Chinese jetliner are marching towards new journeys unceasingly. Mr. Zhang Qingwei, Secretary of the CPC Heilongjiang Provincial Committee, accompanied by Mr. 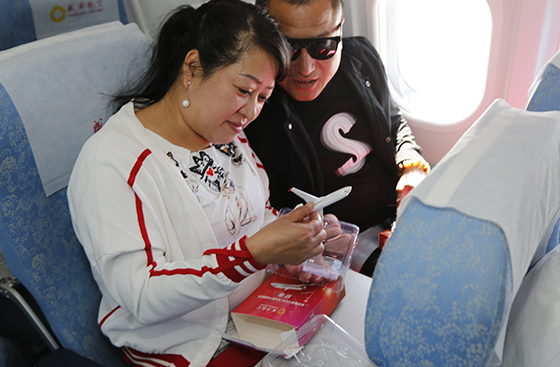 He Dongfeng, Secretary of the Party Committee and Chairman of Commercial Aircraft Corporation of China, Ltd. (COMAC), boarded ARJ21 aircraft to experience the aircraft at Harbin Taiping International Airport and learned about the operation condition of ARJ21 aircraft on site. Mr. Wang Wentao, Deputy Secretary of the CPC Heilongjiang Provincial Committee and Acting Governor of Heilongjiang Province, Mr. Li Haitao, Vice Governor of Heilongjiang Province, Mr. Zhang Yupu, Standing Committee Member, Secretary-General and Director of General Office of the CPC Heilongjiang Provincial Committee, Mr. Wang Zhaoli, Standing Committee Member of the CPC Heilongjiang Provincial Committee and Secretary of the CPC Harbin Municipal Committee, Mr. Nie Yunling, Vice Governor of Heilongjiang Province, and Mr. Sun Zhe, Mayor of Harbin, boarded the aircraft in accompany. 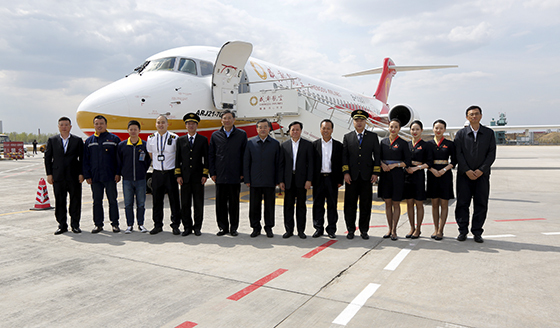 Mr. Zhao Yuerang, President of COMAC, rode on the aircraft and experienced the flight from Chengdu to Harbin with a stop-over at Jinan; Mr. Liu Linzong, Deputy Secretary of the Party Committee and Vice President of COMAC, rode on the aircraft and experienced the round trip between Harbin and Heihe; Mr. Cheng Fubo, Vice President of COMAC, attended the welcoming ceremony at the airport. From now on, ARJ21 aircraft will take Harbin Taiping International Airport as the hub and operate in a route network of "1+4" layout: "1" refers to the long route of Chengdu-Jinan-Harbin with a total length of more than 3200 km; "4" refers to the four regional routes in Heilongjiang province taking Harbin as the hub, which are Harbin-Heihe, Harbin-Wudalianchi, Harbin-Fuyuan and Fuyuan-Jiamusi. ARJ21 aircraft will fly round trips between Harbin and Chengdu with a stop-over at Jinan (EU2239/40), between Harbin and Heihe (EU2795/6), and between Harbin and Wudalianchi (EU2789/90) every Monday, Wednesday, Friday and Sunday; and fly round trips between Harbin and Fuyuan (EU2793/4), and between Fuyuan and Jiamusi (EU2791/2) every Tuesday, Thursday and Saturday. Since the maiden trip of ARJ21 aircraft on June 28th, 2016, Chengdu Airlines has undertaken the mission of the world's first customer of ARJ21 aircraft, received 5 aircraft, and opened the routes including Chengdu-Changsha-Hongqiao, Chengdu-Hefei-Wenzhou and Chengdu-Shangrao-Nantong. The fleet has flown safely for more than 2600 hours and accumulatively carried more than 65,000 passengers. Route operation has been advanced steadily. 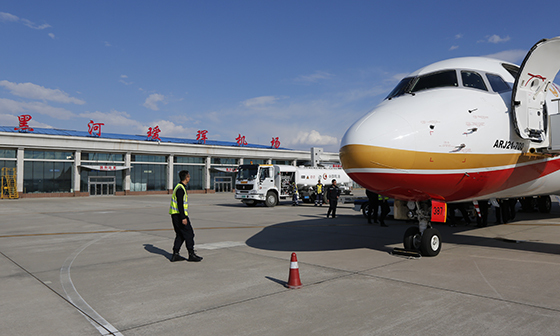 After the opening of the new routes in Heilongjiang province, Chengdu Airlines would practice the regional aviation operation mode of combining trunk and regional aviation by taking ARJ21 aircraft as the main force and taking Chengdu Shuangliu Airport and Harbin Taiping Airport as the base, and construct a regional aviation network that covers the regional airports in Heilongjiang province, radiates to the regional airports in northeast China and connects the hub airports and regional airports throughout the country, which is a positive contribution to accelerating the construction of Harbin international aviation hub, increasing the exchanges and cooperation of Heilongjiang province with foreign and domestic partners, developing rich tourism resources in the concept that "lucid waters and lush mountains are invaluable assets", and promoting economic development. The starting of the hub regional aviation operation mode of ARJ21 aircraft in Heilongjiang province indicates that Heilongjiang is not only an important base for the research and development of civil aircraft in China, but also a backbone base for the marketing and industrial development of civil aircraft in China. The onboard ground test of nacelle anti-ice system under icing conditions and the onboard ground development test for engine fan ice shedding under icing conditions were carried out on ARJ21 aircraft in Harbin in February 2012, which demonstrates that ARJ21 aircraft is able to operate safely on the ground under icing or sleeting conditions. In C919 program, Harbin Aircraft Industry Group Co., Ltd. (HAIG) is responsible for the research and development of wing-to-body fairing, nose landing gear door, main landing gear door and vertical stabilizer. In December 2017, with the full support of Heilongjiang Provincial Government, CAAC Northeast Regional Administration and Heilongjiang Provincial Airport Management Group Ltd., ARJ21 aircraft conducted route adaptability flight among seven airports in Harbin, Heihe, Fuyuan, Jiamusi, Mohe, Wudalianchi and Changbai Mountains in 19 flight days and more than 60 flights, which fully verifies the adaptability of the aircraft in extreme cold condition and conducts simulation verification to the serviceability and the operation supporting capability. Mr. Zhang Qingwei (L7), Mr. Wang Wentao (L6) and their delegation went to the airport and learned about the maiden trip on site on May 2nd, 2018. ARJ21 aircraft landed at Heihe Aihui Airport on May 2nd, 2018. A passenger was given a model of ARJ21 aircraft on May 2nd, 2018.